First, let me thank everyone for their support after the death of my brother Larry in May. Losing four brothers in five years absolutely gutted me. 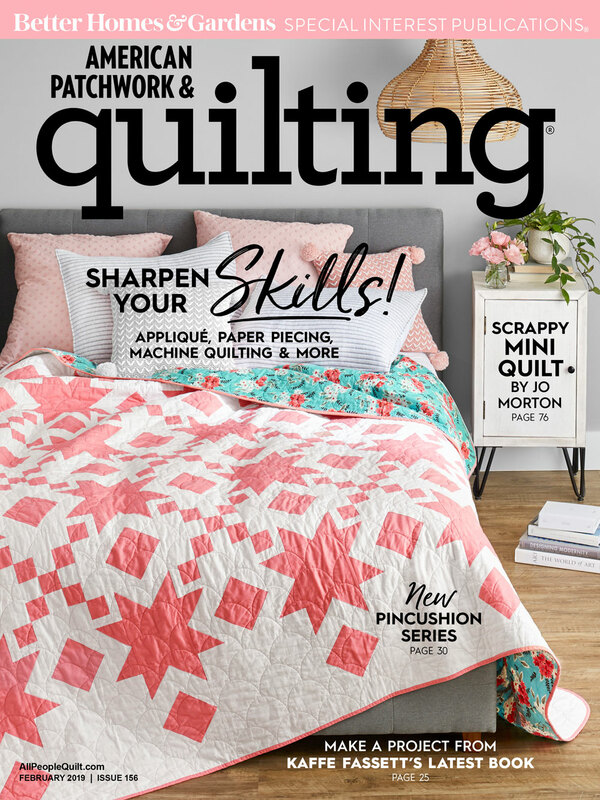 Their deaths have made me very reflective of what is important in life, and one of the things I re-discovered is that designing, making, teaching, and talking about quilts and quilt designs IS very important to me. 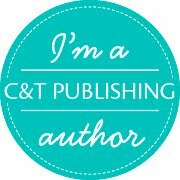 On to my big news! Let me introduce Go For a Spin, one of my latest designs now appearing in the February 2019 issue of American Patchwork & Quilting magazine. It's due to hit newsstands December 4, but I received an email today from a fellow guild member that they already received their copy in the mail! All photos used with permission from American Patchwork & Quilting®. ©2018 MEREDITH CORPORATION. ALL RIGHTS RESERVED. How fun are these? I just got the quilt back and was reminded all over again how much I love it. Hooray! A couple of quilt finishes. First up is a quilt for my daughter's partner. He had a big birthday this year and I thought this design would be perfect for him. I bought a kit a few years ago at a local shop then set it aside. It was intended as a 60'' square wall hanging and I knew the perfect place in their home for it. Unfortunately, they put an equally beautiful piece of art there recently. So, with a little manipulation of the pattern and fussy cutting, the quilt became 60'' x 80''! The pattern is Cadence by Pink Hippo Quilts. I think I'm as in love with the back as I am the front! I used all leftover large pieces. Next up is a quilt for a family friend. She inherited the top from her grandmother and didn't know how to go about getting it quilted. I volunteered, then later recognized my folly. I had no idea what to do! I asked experienced longarmers about loading a quilt with curved edges, any pitfalls I may encounter, etc. Mind you, I have a longarm but only do pantograph quilting. I am not good at free-hand and custom quilting. Ugh. I finally sucked up the courage to start and am very happy with the results. I did a bit of "needle sculpting" as I went along to tame a few bubbles that popped up. Just tucked the fullness under another piece and stitched down with silk thread and a fine needle right before quilting that row. It worked out great and now I'm ready to tackle another vintage quilt that a friend gave me. Did I mention I already had the perfect backing on hand? Did I also mention the lesson learned? I decided to buy the binding fabric when the quilt was on the machine and couldn't take it with me. I picked out a blue that I thought would be perfect and made miles of bias binding. Once I stitched the binding on the quilt, though, it looked terrible! It completely took over. So, the day before I flew to Iowa to deliver this quilt I went to the store, made only a half-mile of bias binding, and stitched it onto the quilt the morning of my flight. Much better. 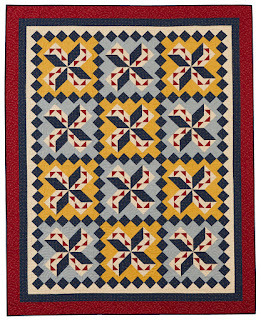 It lets the quilt shine instead of screaming, "look at me!" These Modified 9-Patch blocks measured 17'' so this was a perfect design to complement the quilt. Today I'm linking up with Confessions of a Fabric Addict, Crazy Mom Quilts, and Busy Hands Quilts. In December, I challenged quilting friends that attend Drift Creek Camp to make new quilts for their beds -- all of us using the same pattern! 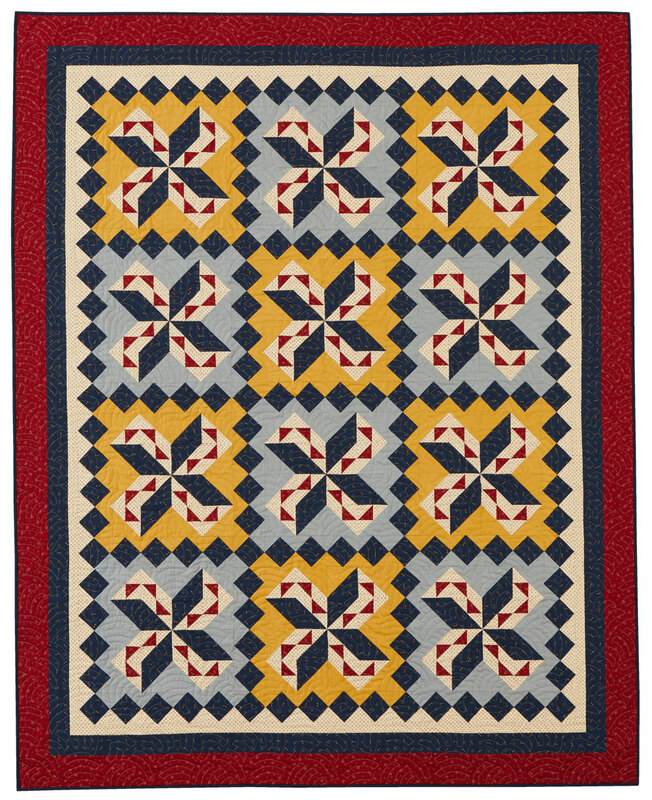 It is the Be Mine quilt in the "free patterns" tab above. 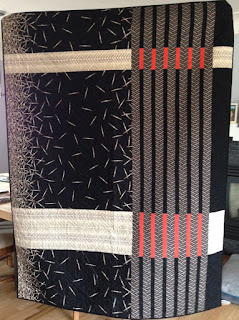 It is also affectionately known as the Oops quilt because I cut all of my original strips at 2'' instead of 2-1/2''. Kind of embarrassing for the designer, but that's life! I've heard from quite a few campers and seen a couple of the finishes already. This is going to be fun! I decided to make mine super scrappy and explained how to do that in the instructions, but I didn't give the number of squares to cut for each fabric. That was intentional. Many people have changed the design to suit their own purposes and my numbers wouldn't mean anything. However, if you like the black/blue/shirting quilt below, keep reading to the end and I'll give further information. I'm pressing toward the right on all the blue strips and to the left (toward the black) on all the strips with black. 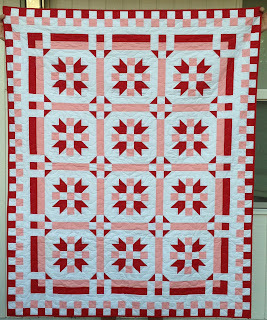 This is a great project to use as leaders and enders ala Bonnie Hunter at Quiltville.blogspot.com. Truly, most of the work is in the cutting... unless you're lucky enough to have a bunch of 2-1/2'' squares lying around! 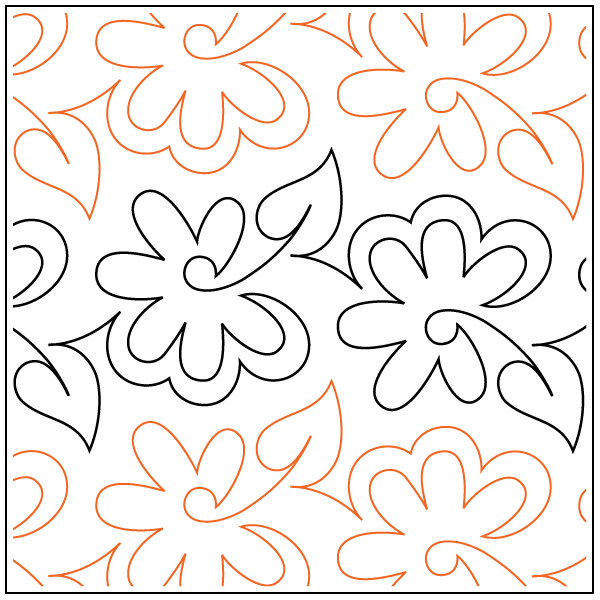 Feel free to check out the other pattern on my Free Patterns tab above. I plan to upload more as the year proceeds. All I ask is that you credit me back as the original designer and send people to my site if they'd like to make the pattern as well. Thanks. 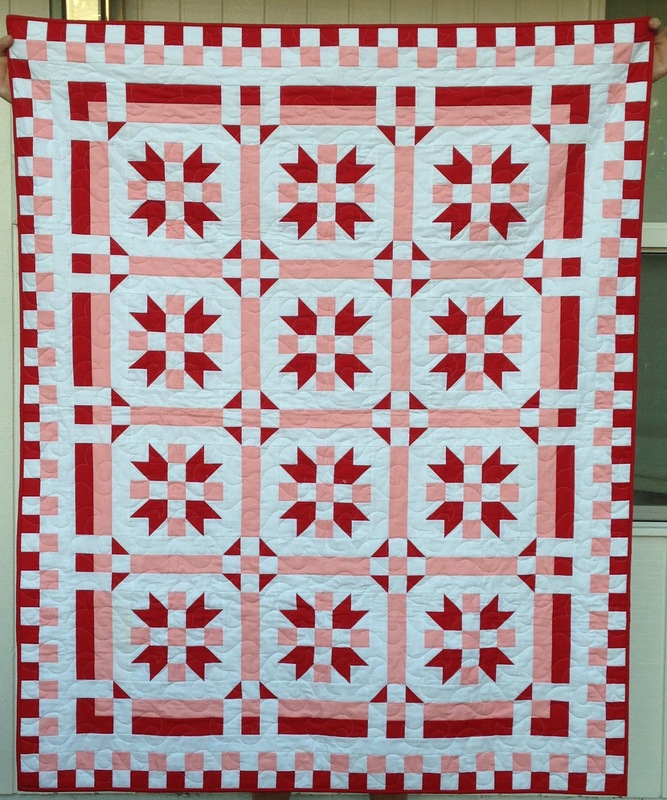 I'd love to see pictures of your finished quilts and share them on the blog! 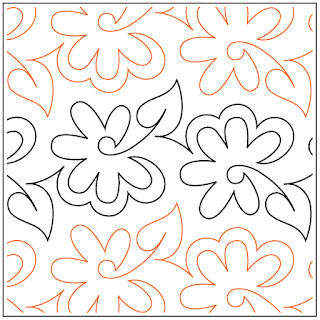 You'll also need to make 144 black and shirting half-square triangles that will finish at 2'' in the quilt. I used 3'' squares and made two at a time. If you do this, you'll need 72 black squares and 72 shirting squares. If you use the Easy Angle ruler to make half-square triangles, you truly can cut this quilt out using only 2-1/2'' strips! Thanks for stopping by today. If you didn't arrive here from Jo's Country Junction, you definitely need to pay a visit to her website. Here's a link to what I did with one of Jo's patterns... of course, I made it scrappy! 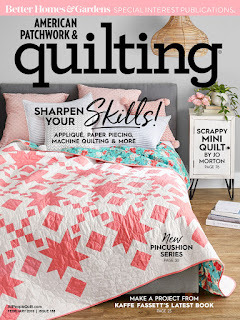 Okay, I don't really have a quilt finish per se, but I do have two new, free patterns posted on my blog today! First up is Be Mine. Remember, this was my Oops quilt where I accidentally cut all the strips at 2'' instead of 2-1/2''. I promise the pattern is correct! This one finishes at 66'' x 82''. I'm cutting up a very scrappy version right now for this year's Drift Creek Quilt retreat. I offered the pattern for free to all the attendees to see how many different versions we could have on our beds at camp this year. I'll post those pictures in late March. Second up is No so Mysterious, offered in four sizes. Here you see the twin size which finishes at 60'' x 84''. The four sizes range from 60'' to 108''! Please, please, please if you use one of my free (or purchased) patterns, I would appreciate being named as the designer. It is getting harder and harder to fight design theft. 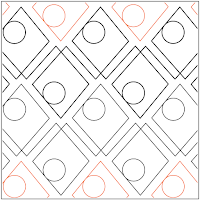 I'd also appreciate you directing your friends to this site to download their own copy of my patterns. Thanks for understanding. Does anybody else start a Block of the Month (BOM) then never finish?! 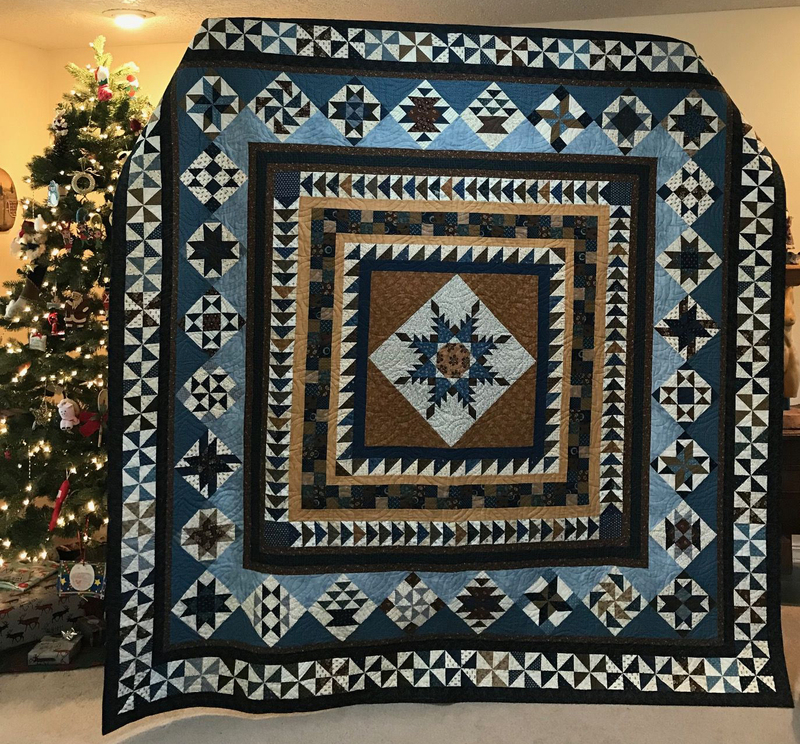 Jo Kramer of Jo's Country Junction has invited readers to sew along with her and finish up some quilts that may be languishing in your cupboard. I have two. One is incredibly detailed and complicated and is not going to be worked on any time soon. :) The other is from a quilt shop that was in Iowa and I bought it in 2010! I've started on this quilt several times and every time I do, I make major errors or don't love my fabric choices. Well, 2018 is the year for this to be finished. 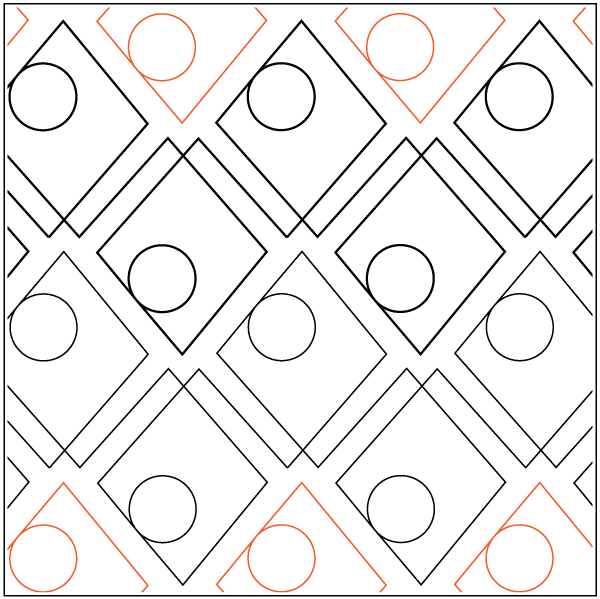 Above shows what the pattern will look like when finished. The picture below shows my first three rows. Wouldn't you know it, when I pinned this on the design wall today, I found ANOTHER error! The last time I pinned this up, I had sewn a row on upside down. 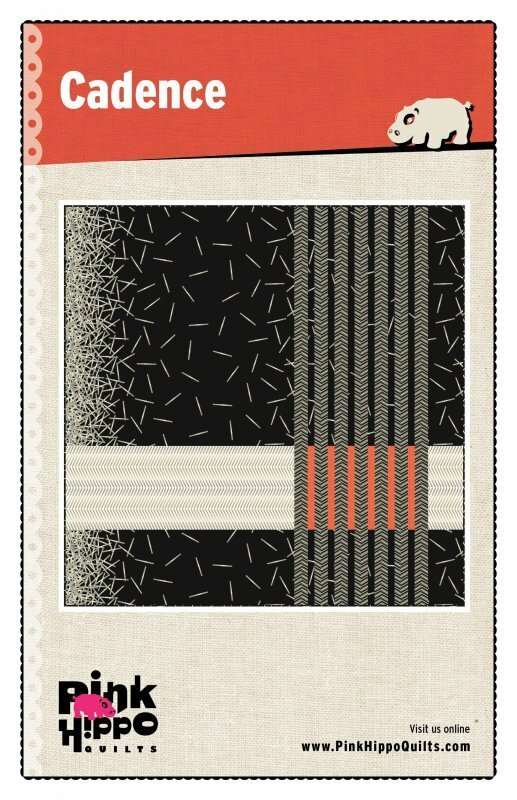 Today, I found that the block in the lower left corner should have the gold portion of the half-square triangles pointed inward... otherwise the background fabric doesn't flow. How did I miss that? Ugh. My other issue with the quilt is the fabric in the center of this block... the blue and white. It occurs in several places in the quilt but just stands out waaay too much for me because there is not a lick of white anywhere else in the quilt! I'm going to try a couple of experiments before pulling them out of the quilt. The first is tea stain with a small paintbrush. If that doesn't darken them enough, I may try a fabric marker. Worst case scenario is that I remove and replace them with something else. 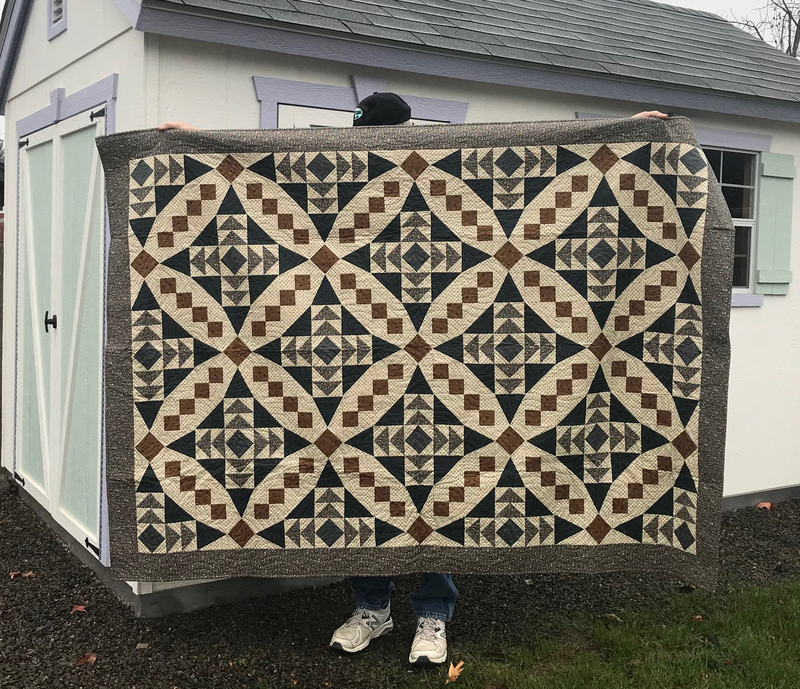 It's sad to say I'm not nearly in love with this quilt as I was when I signed up for the block of the month, but believe I will fall in love again as I become more successful. Wish me luck! Head over to Jo's Country Junction to see more. I confess -- I'm not really working on this one, but I wanted Jo to see what one of her patterns looks like in all scraps. 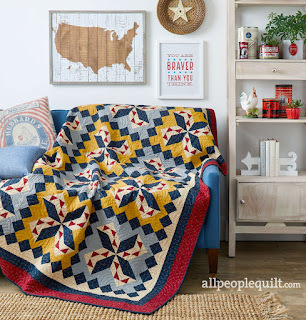 This is the Modern Day Patriot quilt from Jo and Kelli's book Country Girl Modern. I knew as soon as I saw it that I would make it scrappy. This one will be going to my brother Jimmy as a Quilt of Valor just as soon as I have one finished for his son-in-law. Brother Jim served 26 years in the Navy, enlisting at age 17. (He had to have our parents permission!). He retired then worked for the Department of Defense until he was 65. Our family moved a lot when we were kids, with my brothers and sisters sometimes attending a different school every year. I was the youngest and we moved a lot but stayed in the same school district so I had a much different experience than my siblings. I thought scrappy was appropriate as Jimmy has had soooo many different homes over the years. He graciously allowed his daughter to marry an Air Force man, thus the need for another quilt. :) Here's a close-up of the scrappy goodness. I can't wait to share this one with my brother! My husband Mike has a friend that has been there for him for years, always helping out with any project -- including making new doors for our kitchen cabinets and a custom cutting table for me that holds bolts of fabric and is the perfect size! 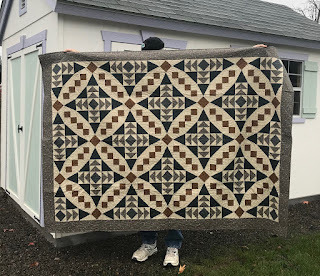 I knew that he needed a grand gesture as a thank you, and this quilt is it! I can't wait to see his face when it gets delivered. 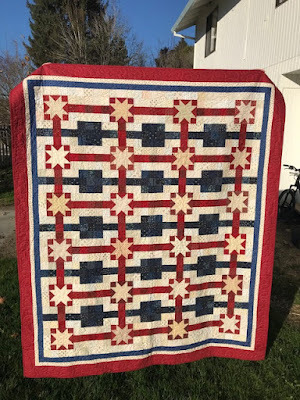 This is Sue Garman's Washington Medallion quilt pattern. 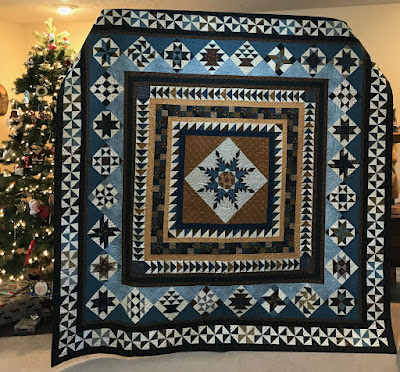 I joined a Block of the Month years ago from Stitchin' Heaven quilt shop and worked on this blue and brown beauty for years.